WITH EXTRAORDINARY ELOQUENCE, keen perception, and a delightful sense of humor, Rabbi Yaakov Asher Sinclair, noted author and lecturer, focuses his lens on the world around us and shows us with brilliant clarity how it all connects to the world beyond. Whether he is discussing shidduchim or child-raising, jealousy or generosity, technology or ecology, Rabbi Sinclair brings us to that exhilarating “aha” moment we all experience when we glimpse truth. He might be describing a $100 million business deal or his cantankerous old Espresso maker, a drive through central Jerusalem or a child’s first airplane ride—and then suddenly we see how it all leads to one place: beyond the blue…to the Blue Beyond. 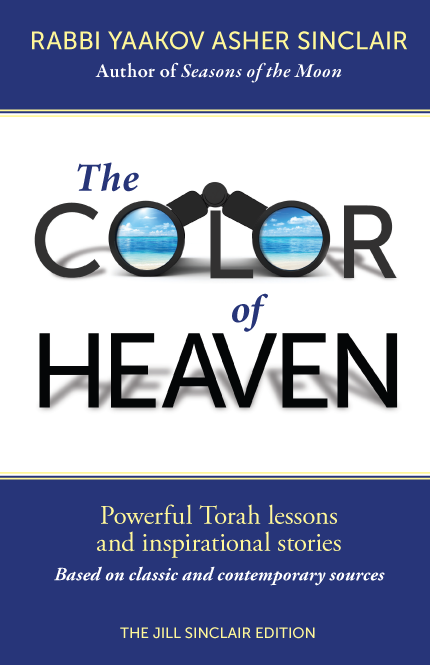 Filled with inspirational stories and powerful insights based on the weekly parashah, The Color of Heaven will change the way you look at your world. THE TORAH LESSONS in this work are short, but each contain a powerful message that is both enlightening and inspiring. The ideas are culled from true Torah sources, both ancient and contemporary, and all are spiced with Rabbi Sinclair’s unique masterful presentation. I highly recommend this book to anyone seeking to be enriched with lessons on the weekly Torah portion that are uplifting and informative. I commend the author for his contribution to the community and pray that Hashem Yisbarach grant him and his family life and health and the wherewithal to continue to benefit Klal Yisrael in the many and varied ways that he does. “KNOW THY AUDIENCE”—that is the first rule of writing. Rabbi Yaakov Asher Sinclair, a respected talmid chacham and lecturer, knows his audience: people of the 21st century, living fast-paced, information-saturated lives. Indeed, there is something in The Color of Heaven for everyone. The Color of Heaven culls the best of Rabbi Sinclair’s insights from his “Weekly Torah” parashah sheets, which have long been translated into Spanish and French, edifying and providing spiritual nourishment to readers worldwide. A random glance in the book demonstrates that Rabbi Sinclair knows a good story when he sees one. For instance, there is the one about the American aircraft carrier USS Lincoln whose crew grew alarmed when a blip appeared on the radar screen in the middle of the ocean. Realizing they were on a collision course, the captain signaled the other, a Canadian and his crew, to change course. Wisely deciding that discretion was the better part of valor, the Canadians promptly changed course. Rabbi Sinclair uses this to introduce a thought on the topic of humility and then ties it neatly into the portion of the week. As engaging as Rabbi Sinclair’s style is, this is not just a book of fun stories. It is a refreshing and exciting adventure in Torah analysis. When I received my review copy late Friday afternoon, I immediately turned to the parashah we were going to read the next day. And right there I found a novel thought I had not heard before that helped me with my Shabbos derashah in shul. The Color of Heaven covers every portion in the Torah. Typically, each parashah has three separate Torah thoughts. Each is just right: not too long and not too short; engaging, practical, contemporary; deep and classic, yet fresh. The Color of Heaven is something you will keep on the shelf and refer to year after year. Kudos to Rabbi Sinclair for a fun and insightful book that belongs in every Torah library. RABBI YAAKOV ASHER SINCLAIR has been part of Ohr Somayach Jerusalem since 1987. He gives a daily Gemara shiur in the Wolgert Intermediate program, a weekly shiur in Jewish philosophy, and is a senior staff writer of the Torah Internet publications Ohrnet, Torah Weekly, and Seasons of the Moon. Rabbi Sinclair is a popular public speaker both in Israel and in the States, and spoke at the Agudah Convention plenary session. His articles and essays have been published in many journals and magazines, including The Jewish Observer, American Jewish Spirit, AJOP Newsletter, Zurich’s Die Judische Zeitung, South African Jewish Report, and many others. His first book, Seasons of the Moon—a unique combination of fine-art black-and-white photography, Torah essays, and poems—received outstanding critical acclaim in LensWork, Zoom, and Focus magazines, as well as Jewish Action. Rabbi Sinclair was born in London and lives with his family in Jerusalem. When considering any task, we blithely assume that all we need is to do this and do this and do this and then—then it will be finished. Our project, in all its glory, will spring suddenly into existence. So, often we become frustrated when things don’t go according to plan. We assume that the actual segues from the potential, that it’s all one system. In reality, plans exist in a different dimension from that of implementation. The gap between preparation and execution, potential and actual, is as cavernous as the gap between dreams and the waking world. That things have been done in the past—buildings built, ships constructed, records recorded, paintings painted—even in their trillions, does not diminish the fact that bringing something from the world of “could-be” into the world of “is,” is a leap of dimension, a change of magnitude. The Jewish year has two beginnings. The first of Tishrei, Rosh HaShanah, is known as the beginning of the new year. But the first of Nissan is also called the beginning of the year. Rosh HaShanah is the beginning of the year spiritually. This was the day when God thought to create existence. This is why we refer to Rosh HaShanah as “haras olam—the day of the world’s conception” (Yamim Noraim prayers). God conceived the world on Rosh HaShanah, but the first of Nissan is the day when the world became a physical existence. Thus Nissan is related to the word nitzan, which means “first bloom.” Just as the first bloom is the beginning of the completed state of the flower, so Nissan marks the first bloom of existence. Thus Nissan is always in the spring, when new life “springs” forth, blooming from the earth. After the original creation ex nihilo, God has not brought anything new into existence. Rather, He forms and re-forms, using the existing building blocks of creation. Anything we manage to create uses prefabricated pieces of existence in new and different permutations. The process of actualizing our thoughts and aspirations, of giving substance to our dreams, is akin to God “thinking” to create the world and then bringing His thoughts to fruition. When we manage to transform a concept into a reality, we are imitating God, actualizing His “thoughts” to create existence out of total nothingness. You could hardly find two objects that are more different from each other than the sun and the moon. The sun is the most prominent feature of our solar system, containing approximately 98 percent of the solar system’s total mass. One hundred and nine Earths would be required to fit across the sun’s disk, and its interior could hold over 1.3 million Earths. The sun’s outer visible layer has a temperature of 11,000 degrees Fahrenheit (6,000 degrees Celsius), and this layer has a mottled appearance due to the turbulent eruptions of energy on the sun’s surface. Solar energy is created deep within the core of the sun. Here, the temperature (27 million degrees Fahrenheit, or 15 million degrees Celsius) and pressure (340 billion times the Earth’s air pressure at sea level) are so intense that nuclear reactions take place. Every second, 700 million tons of hydrogen are converted into helium by nuclear fusion. In the process, 5 million tons of energy are released. The moon is the sole satellite of the planet Earth. It is an inert body 238,857 miles (384,403 kilometers) from the Earth. Its diameter is 2,160 miles (3,476 kilometers). Both the rotation of the moon and its revolution around the Earth takes approximately 29 days, 12 hours, and 43 minutes. This synchronous rotation is caused by an asymmetrical distribution of mass in the moon, which has allowed Earth’s gravity to keep one lunar hemisphere permanently turned toward Earth. The moon has a crust 37 miles (60 kilometers) thick at the center of the near side. If this crust were uniform over the moon, it would constitute about 10 percent of the moon’s volume. It has a maximum surface temperature of 253 degrees Fahrenheit (123 degrees Celsius) and a minimum surface temperature of -387 degrees Fahrenheit (-233 degrees Celsius). There is another similarity between the sun and the moon that is rather strange. It’s everyday knowledge, but when you think about it, there’s no ostensible reason why it should be so. Take a piece of cardboard and make it big enough that if you were to hold it up to the sun, the sun would be obscured. Now with that same piece of cardboard, hold it up to the full moon. That same piece of cardboard will cover the moon and the sun. Isn’t that strange? Of all the places our planet could be located in space, we happen to be exactly where the moon and the sun look the same size to us. In the Talmud (Chullin 60b), Rabbi Shimon ben Pazi poses a contradiction in a verse in parashas Bereishis. It says both that “God made two great luminaries of light” and that He made “the great luminary of light and the small luminary” (Bereishis 1:16). How can it be that at first there were two great orbs of light and then only one? Those who seek honor, like the moon, are brought low, while those who bear insult in silence, like the sun, will be rewarded. But because the moon accepted the verdict without complaint, God added the stars to the night-scape to give the moon a retinue of light. Yet, when we look up at the sky, the moon and the sun look the same size to us. We know that one is millions of times the size of the other. But they look the same size. Isn’t it strange that we, the dwellers on this planet, are standing in a place in space where these two totally dissimilar orbs appear the same size? When we look up at this celestial anomaly, we are looking at a cosmic hint. A hint to a time that was. A hint to a time to come, when the lack and blemish of the moon will be filled, when it will be restored to its former glory and the radiance of the Almighty will fill the world, as it did during the six days of Creation. All of us experience moments of poetry. These may come from events in our personal lives—a birth, a death, the reuniting of long-lost family. Or these moments of inspiration may spring from our sense of joy and wonder at the creation. As artists, however, we are not content to leave those moments of inspiration in the realm of the intangible. We feel the need to give them a physical existence, to “mortalize” them in words, in song, in paint, or as a photograph. For the photographer, apart from these basic material constrictions, there is another level of constraint to deal with. As Edward Steichen said, “Every other artist begins with a blank canvas… The photographer begins with the finished product.” The photographer-as-artist must coax from this world a spirit that is reluctant to epitomize for his lens. He tries to make visible the invisible—“to make seen what without you might never have been seen,” as Robert Bresson put it. Art is inspiration wrestling with constriction, the constriction of the physical doing battle with the idea. For in whatever medium the artist chooses to clothe his muse, he must struggle with the characteristics and the limitations of that medium. After all, he is trying to coax that which is beyond the physical to reside within the physical. It’s no wonder that good art is rare. Without this struggle of vision-constricted-through-media, however, there is no art; the mind can dance, but there is no dancing partner. Art exists as a function of constriction, not in spite of it. That dance of the mind and spirit with paper and paint, that exquisite tension between the material and the ephemeral, is where art lives and breathes. Just as a flute produces music only by the constriction of breath through a metal pipe, and without that constriction, that limitation, there is no music, so all the plastic arts rely on the celebration of limits. And, ironically, the more constricting the medium, the more poetic the product. To this day, black-and-white photographs are esteemed as “more artistic” than less limited color photographs. Photographs themselves are considered less artistically worthy than painting, because they are closer to reality and less restricted by the medium. “In the image of God, He created him” (Bereishis 1:27). This verse in the Torah is often misunderstood as meaning that Judaism believes in an anthropomorphic God—that God has arms, feet, a head, and a back. Obviously this cannot be a correct understanding. God is a nonphysical, nonspiritual entity of whose essence we can ultimately know nothing. However, whatever ends up in this world as a hand is but the lowest incarnation of something that starts off at the highest level as an aspect of God’s interface with His creation. Thus, to the extent that it is possible, God gives us the ability to know Him from knowing ourselves, as it says, “From my flesh, I will see God” (Iyov 19:26). On one level this means that by reflecting on the miraculous nature of the body, the most complex and brilliant feat of engineering in the universe, a person can sense the existence of a Creator. On another level, though, if God created us in His image, that means that by understanding ourselves, we can understand something about God. Thus the artist’s facility to create—the ability to take the material world and make it speak the language of emotion, of inspiration—must be the most distant reflection of some characteristic of God. The fact that art exists must reveal some aspect of the divine. In other words, this world and everything in it is God’s Work of Art. Interestingly, the word for “artist” in Hebrew, tzayar, is related to the word tzar, meaning “narrow” or “constricted.” This is the connection between being an artist and my religious life. My life as a Jew is brimful of constrictions and restrictions. Rather than hamper and frustrate me, I find that these very restrictions are paint and canvas for my soul. I believe that God put into this world a mystical “paint box” called the Torah. The Torah allows me to turn this world into art. The commandments of the Torah empower me to make the physical world speak the language of the spirit. They are the media through which I can create a partnership with the Ultimate Artist in His artwork. God blessed the seventh day and sanctified it, because on it He abstained from all His work, which God created to make. Taking a taxi home, we turned a corner and came upon what seemed like the mother of all Jerusalem traffic jams. Nothing moved. Not an inch. What was it? A burst water main? A demonstration? A visiting dignitary? I climbed out of the cab and peered into the distance. There, swirling in mists of dry ice, was the strangest vehicle you can imagine. Underneath it all was something that looked suspiciously like a Ford Transit, but from every angle possible there stuck out flashing colored lights and projectors, twirling silver globes catching the multicolored lights, and, atop the whole caboodle, a huge golden crown about seven feet wide. The music that was blaring from this thing had enough high-end frequencies to part your hair at ten feet. This beast was no fugitive float from a New Orleans Mardi Gras procession—it was the way we Jews greet a newly completed Torah scroll on its way to its new home. And what a homecoming! The streets were full of people dancing around the Torah scroll underneath a chuppah (wedding canopy); in front of the float were about fifty Yerushalmi kids each with a flaming torch in his hand (try getting that one past the New York Fire Department!). Apparently it was said of Benito Mussolini, the ruthless dictator of Italy in the thirties and forties, that “at least he made the trains run on time.” Whether it was ever said of Mussolini or not is moot. The fact is that the remark reveals a fundamental facet of fascism—efficiency as an end in itself. In a world where there is no belief in God—and thus bereft of a higher purpose—in such a world, ultimately there is nowhere to go. All that is left is to get there as efficiently as possible. In direct contradiction to this worldview stands Shabbos. Shabbos is our weekly testimony that the world is going somewhere, that things are important, and efficiency is never an end in itself. In Jerusalem, the buses can be very far from on time; the traffic can be held up for half an hour. And it’s all to demonstrate that there is something in this world greater than efficiency. It’s called purpose.